Lynsey Dyer doesn’t just walk through life; she shreds it. 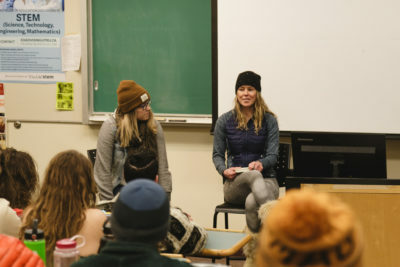 TRU adventure studies students were given an opportunity on Wednesday night to listen to Dyer’s story, one of a professional skier, competitor, filmmaker and even a desk jockey for some time. Growing up Sun Valley Idaho, Dyer described day-to-day life as going to school, getting good grades and eventually moving on to university and inevitably marriage. While skiing was a good portion of her early life, Dyer never thought she could make it a career. From that point forward, Dyer continued to break out of barriers put in place by not only society but by the industry she became a part of as her skiing career took off. She became the first woman ever filmed on Jackson Hole, won numerous Big Mountain competitions and went against the grain when it came to her limitations set in place by a male-dominated industry. Repeatedly Dyer was told that she couldn’t do things because she was a woman, but this never stopped her from completing those tasks anyway. “We truly can shift the barriers of what’s possible,” spoke Dyer on her obstacles, injuries and what it took to overcome them all. Dyer’s career took another turn after her idea to start her production film of female skiers was rejected by executives. Turning to Kickstarter, Dyer raised the most money on an action sports film on the platform at $113,000. The film Pretty Faces is now an award-winning production and another boundary hurdled for Dyer. Dyer was asked questions about taking on the industry image, redefining it and the challenges of that, from denying sponsors wanting to sexualize her image, learning from mistakes and making sure that she spends days away from the work elements of her life. All of this was knowledge she wanted adventure studies students to keep with them for their trials ahead. Dyer continued working on her podcast Showing Up, but just wanted to grab a slice of pizza and some ice cream after her TRU presentation.